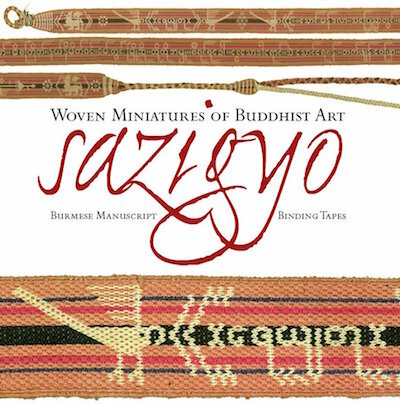 Sazigyo: Burmese Manuscript Binding Tapes - Woven Miniatures Of Buddhist Art, by Ralph Isaacs, is the first book on the art and craft of sazigyo, decorative cotton tapes made by Burmese weavers. As Isaacs says in his preface, his scope is as narrow as the tapes themselves: "This book aims to introduce art lovers and textile enthusiasts to a little-known but fascinating textile art form." Sazigyo are functional objects, used to tie Buddhist manuscripts into bundles, though they are also textual and visual artworks: "Sazigyo are much more than a length of narrow cotton tape: their woven messages and pictorial symbols carry a wealth of information about Burmese Buddhist beliefs and practice". Almost 1,000 colour images of sazigyo are included (reproduced either at 1:1 scale or enlarged) and there is even an authentic sazigyo bookmark instead of a standard ribbon.